Kayaking in New Zealand is one of the absolute musts in this beautiful county. 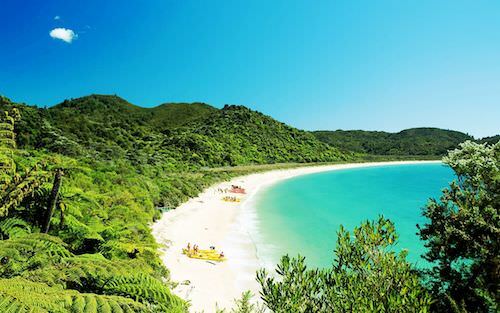 Abel Tasman National Park on the northern tip of the south island of New Zealand is famous for its golden beaches, turquoise waters, native bush walks and spectacular scenery. There are two walking tracks: the beautiful coastal track and the more remote inland track through the hilly centre of the park. The alternative and most recommended way to explore this area is to kayak part of the way to enjoy the maritime perspective and watch the numerous birds and seals that occupy the many islands and coves on the way. One can walk with a backpack or kayak the Abel Tasman route independently. Like many of New Zealand’s Great Walks (see review of another of New Zealand Great Walk, The Routeburn Trek), there are camping sites and huts where one can stay for a fee, and water taxis provide easy transportation in and out of different locations on the coast. For those looking for more comfort, we recommend Wilson’s Abel Tasman, which is the largest and best operator of boats and lodges in the park. Wilson offers 1, 3 and 5 days of hiking and kayaking through the park. The 3-day trip that we took included lodging in their excellent beach lodges at Torrent Bay and Meadowbank Awaroa. Lodges include private rooms, showers, hearty meals, all in a spectacular setting. A good base for the area is the town of Nelson. The town offers some good hiking nearby, breweries and some good restaurants. We stayed at Century Park Motor Lodge, a high-end motel within walk to the downtown which offers clean and quiet accommodations. For dining try Mint Dining Room, located in an iconic 19th century cottage offering fresh local products, and Hopgood’s, which emphasizes more hearty and meaty dishes, located in the heart of the downtown area . 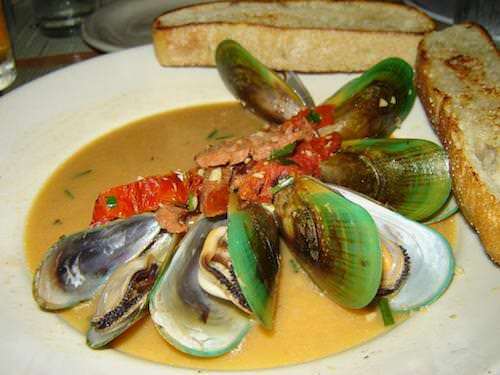 We also loved the Mussel Pot, a quirky little place in nearby Havelock, which focuses on the excellent green lip mussels which are so common in New Zealand. Nelson area also has many excellent wineries that specialize in Pinot Noir (for Sauvignon Blanc head to the nearby Marlborough Wine region). Two of our favorites are the Neudorf Vineyards and Wollaston. You can also find many excellent Pinot Noir wines in the Otago region of the South Island near Queenstown. As the South Island is large with windy roads, it is best to fly to Nelson directly from Auckland, Wellington or Christchurch. Arnon is a tech entrepreneur and worldwide traveler. He writes hotel reviews and travel guides for Mapplr to help people find the best places and itineraries. Esme Vos, founder and editor-in-chief of Mapplr.